WILL YOU CONTROL THE MOST POWERFUL HEROES? 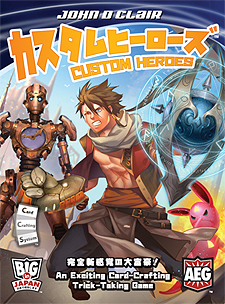 Custom Heroes is a fun and fast version of trick-taking that uses the new and exciting card-crafting system! Change the values and effects of the cards as you play. Upgrade characters to their Ascended forms to always beat the competition. But be careful, each round your opponents may have control of the heroes you have customized! Place better over a series of rounds to win!